T_item Base class of the items in the ListStore. All items must be of type T_item or a type derived from T_item. 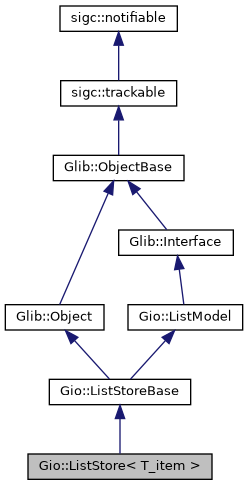 T_item must be Glib::Object or a type derived from Glib::Object. item must be of type ListStoreBase::property_item_type() or derived from it. Use splice() to append multiple items at the same time efficiently. If position is greater than or equal to the number of items in list, an empty Glib::RefPtr is returned. An empty Glib::RefPtr is never returned for an index that is less than the length of the list. See ListModel::get_n_items(). position The position of the item to fetch. item must be of type ListStoreBase::property_item_type() or derived from it. position must be smaller than the length of the list, or equal to it to append. Use splice() to insert multiple items at the same time efficiently. Inserts item at a position to be determined by the slot. Sorts the items according to slot. additions must contain items of type ListStoreBase::property_item_type() or derived from it. Empty RefPtr is not permitted.